BAHAHAHAHAHAHAHAHAH!!!!!!!! Oh my goodness, yes. Yes, yes, yes.....watch this video. Ok, guys, get ready for a brief post loaded with SHAMELESS self promotion. I've had a few people contact me recently and ask if I'm still doing this blog. The answer is complicated, but yes, I still plan to continue posting to Fake-n-Bake, even if not in the frequency that I once did. Why? Well, I'm usually a pretty busy lady, but right now I've got something really exciting taking up almost all of my time. I've been exploring crafting outside of theater for a few years now, primarily in partnership with my dear friend (another talented propster) Sarah Kirkham. She and I started small, selling our leather crafts at local fairs and online. Over the last few years, things have really grown, and now we're to the point where we are pursuing our crafting business full time. Now, here comes the shameless part- our business, Tactile Craftworks, is running a Kickstarter campaign to purchase a laser cutter machine by launching a series of journals we're calling The Atlas Series. Here's a link to our Kickstarter campaign- please take a moment to take a look. If you can contribute, we'll be grateful. If you can't contribute, we'd appreciate it if you spread the word. I really appreciate the support you all give me here on the blog, and I thank you in advance for your support on this! Hello all! Sorry it's been so long since I've posted. I promise, this is a fun one. I'm not sure of the source on this, but I'm guessing that Chic Young drew it. 3 slices yellow cheese, and some kind of mustard/mayo. 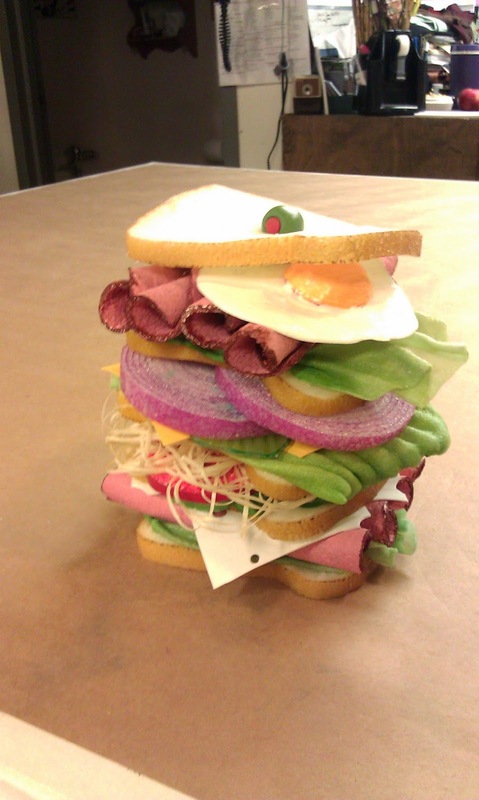 Guys, I'm not gonna lie, I had so much fun making this sandwich! Making all of the parts was fun- some things, I had experience in, some things were brand new. I admit, I took some inspiration from Ariel Lauryn and her amazing Roast Beef Sandwich Puppet because that was one heck of a sandwich! 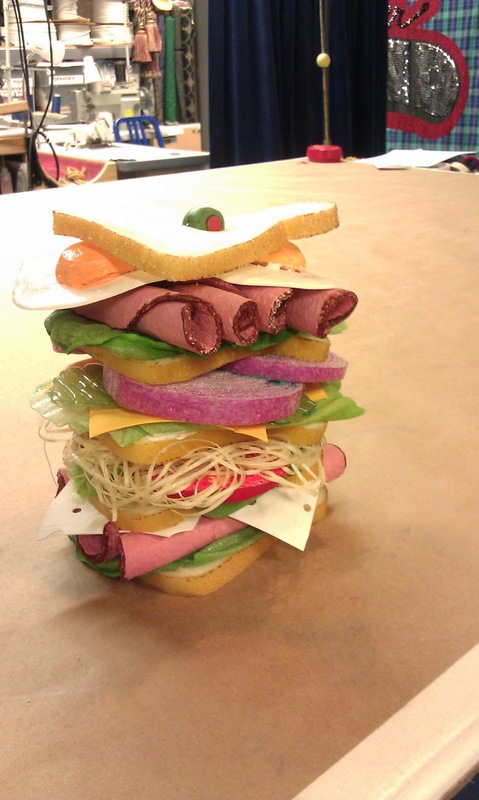 Also, I wanted to capture the cartoony nature of the sandwich, so I didn't try for super-realistic food. I wanted the whimsy of the piece to come through. (Boy, that sounded pretentious, didn't it?) Anyway, here are the things! This is one of my standards. 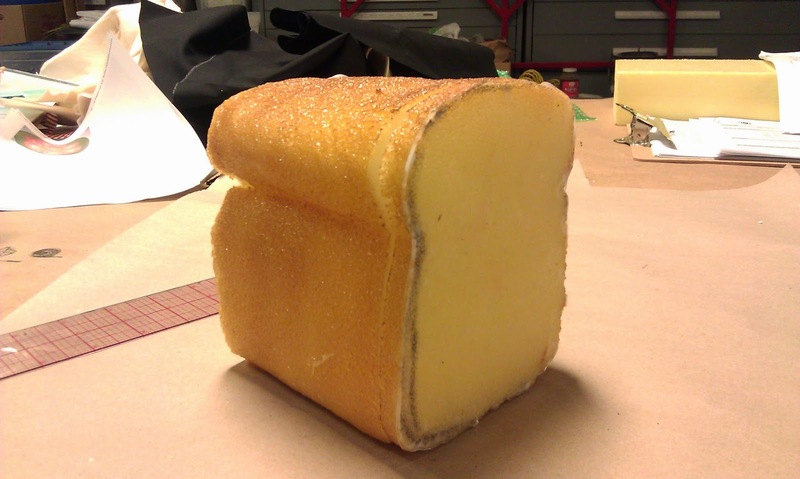 upholstery foam carved into a loaf, coated with latex, and painted to be the right color. Easy, peasy, lemon squeezy. Another one I've done before. I just slice up fake tomatoes and paint the foam insides to look like tomato insides. I'm not a phenomenal painter (look at Ariel's tomatoes, WAY better) but I seem to get the point across! Ok, I can't talk about ham without saying HAM! out loud. This is why. This ham is also my standard ham! Yup, I have a standard ham, my mom is so proud. 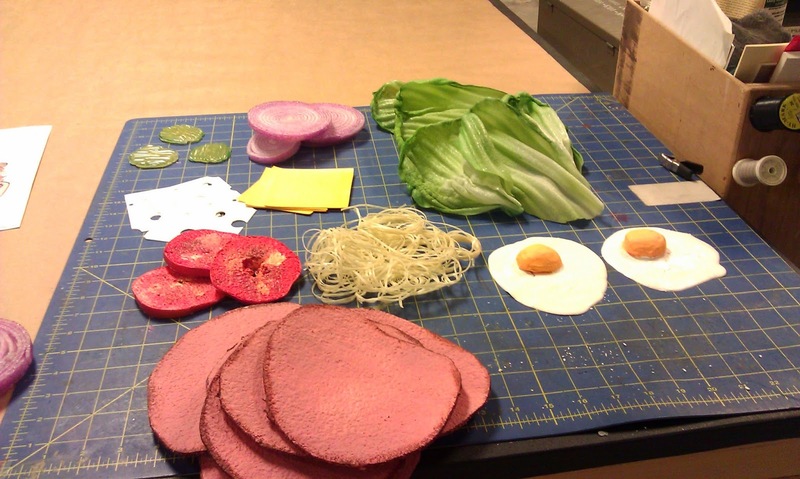 I cut micro foam into ham slices, coat them with Jaxsan (the magic prop goo) and paint them with Design Master Sprays and acrylic paint. This was a fun first. These eggs are made from one of my favorite food prop materials, Acrylic Latex Caulk. Yup, I love the caulk. (That joke doesn't work as well in print. Also, you shouldn't have read that out loud to your kid. In fact, get some books, you weirdo, kids don't want to read about fake food.) Anyway.......I made the whites of the eggs first, by thinning the caulk with water, and letting it settle into an eggy puddle. 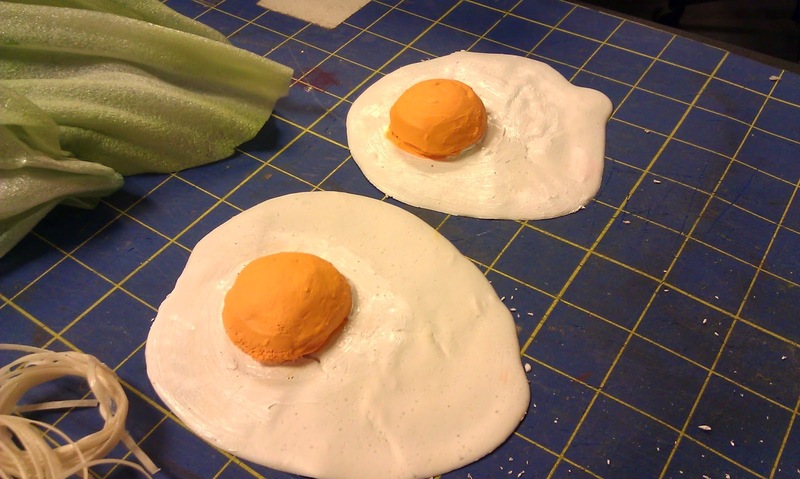 Once that was dry, I sculpted little yolks out of foam, and coated them with more caulk, tinted with acrylics. After this photo was taken, I painted them with a liberal coating of gloss gel medium to shine them up a bit. This one was kind of a gimmie. I knew that I wanted to use some sort of string and white glue to create the pile of noodles. White cotton string is where my mind always goes first, but it is wound, which gives it an odd texture. More importantly, it is too limp to hold the shape of the spaghetti when wet with glue. I started searching around the shop, and found some waxed, flat, wide lacing that looked perfect. Honestly, I don't know what it is, or where it came from, but I made it into a little nest and coated it with flex glue. It worked like a charm! Yes, it's a little flat, so it's more like linguine than spaghetti, but the overall shape of the noodle pile is more important for the effect, in my opinion. I owe some credit on this one- Angie Zylla, our then intern, suggested this technique to me. She told me that I could use micro foam and a heat gun to make lettuce leaves. I lucked out in finding micro foam that already had some ridges on it. I cut it into leafy shapes, and used several colors of Design Master sprays to make them look lettucey. 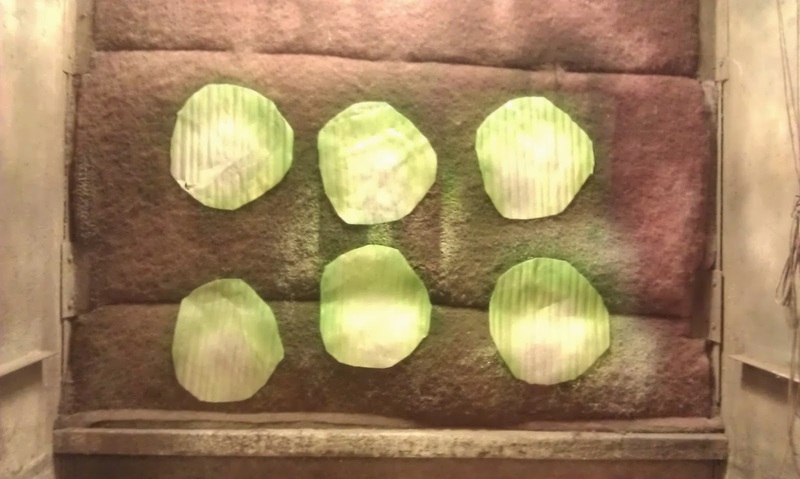 Once they were dry, I used a heat gun to gently curl the edges of the lettuce. 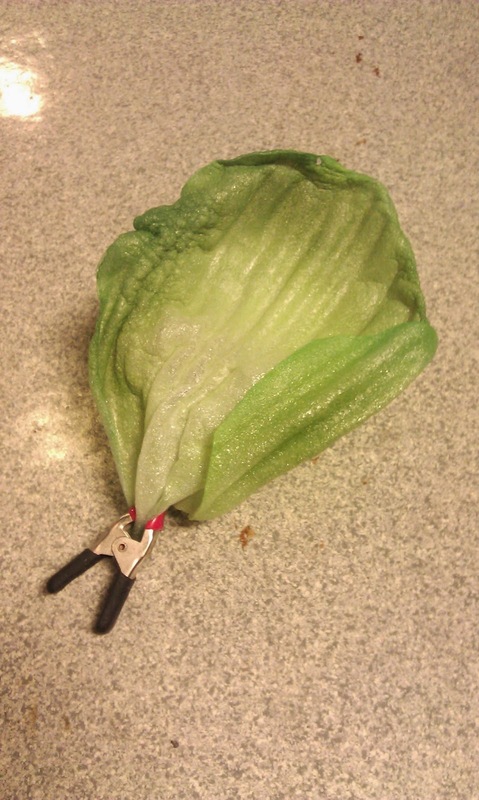 I wanted it to look like it had been pulled off of a head of lettuce, so I used a clamp at the bottom to leave a 'stem.' It took a bit of practice to get these right, and I made a lot more of the leaves than I used, to make sure I was using the best ones. I really liked this technique for this project. I don't think it is realistic enough for close-up fake food, but I love how cartoony and fun it is- it was perfect for a cartoon sandwich. These were fun, too! I really liked the onions that I made for my Pickled Herring for 'Cabaret'. The micro foam has a good color and translucency that reminds me of onions. I decided that these should be red onions, to make them read better, so I spray painted one side of a sheet of thick micro foam to be oniony-purple. Once that was dry, I coated the white side of the foam with spray adhesive and rolled it up. (This worked pretty well. In retrospect, I would have used 3M Fastbond.) Then, I sliced off sections of the onion-loaf to make my rings. I'm really pleased with how they turned out, so cartoony and wonderful. These were my favorite part of the sandwich! These are hot glue, through and through. Here's what I did. 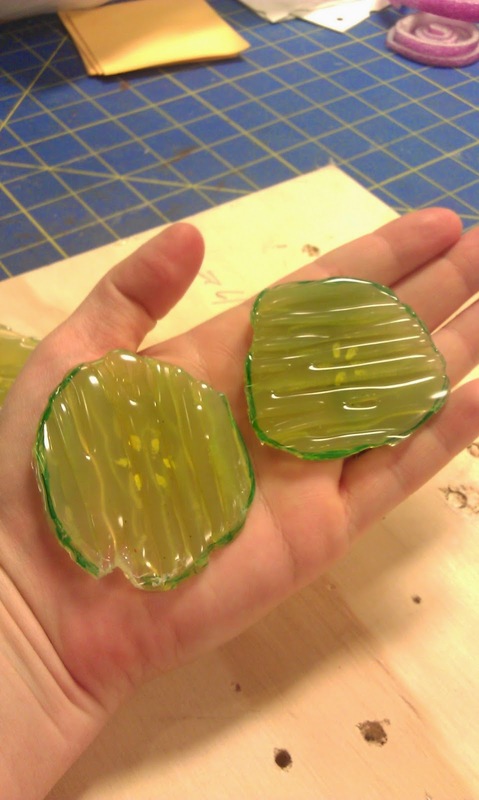 I made the basic shape of a pickle slice out of a little puddle of hot glue. Then, once they cooled, I took those smooth little chips and painted them with spray paint, and little dabs of acrylic for the seeds and rind. Once that was dry, I made passes of hot glue over the smooth sides of the chips, creating the ridges of the pickle chips. I'm pretty proud of these guys, if I do say so myself. Fake pickles, now that's comedy! These cheese slices are another "classic" technique of mine- you can see the details here. Basically, they are smoothed sheets of caulk cut to size and shape. The Swiss cheese was fun, I got to cut holes in it! This one is easy, too! A smear of caulk on a slice of bread is all you need! 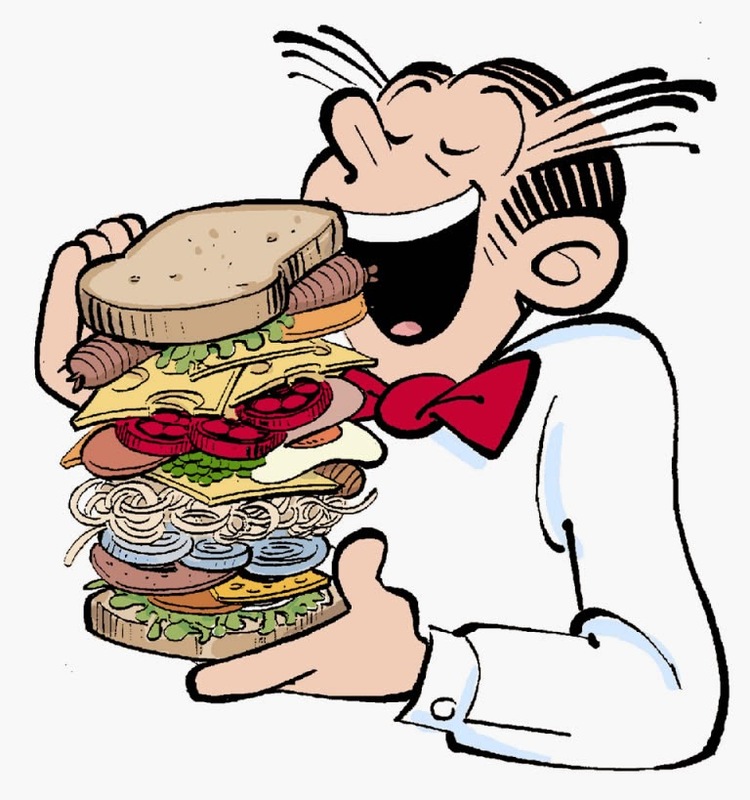 As you may have noticed, Dagwood Bumstead's sandwiches seem to defy physics just a bit, and even if I could stack all of the ingredients 'just so' shipping would be a nightmare, and poor Jamison would have been losing ingredients all night. The assembly took a bit of planning as well, because I wanted all of the ingredients to be visible. Why spend time making hilarious pickles only to hide them between bread slices? I stacked and re-stacked the ingredients until I thought I had them figured out, and then I attached them to each other. I used hot glue to join most of the ingredients but, as some of you know, I always try to use a mechanical fastener when I can. Adhesives are wonderful, but let's cover all our bases! 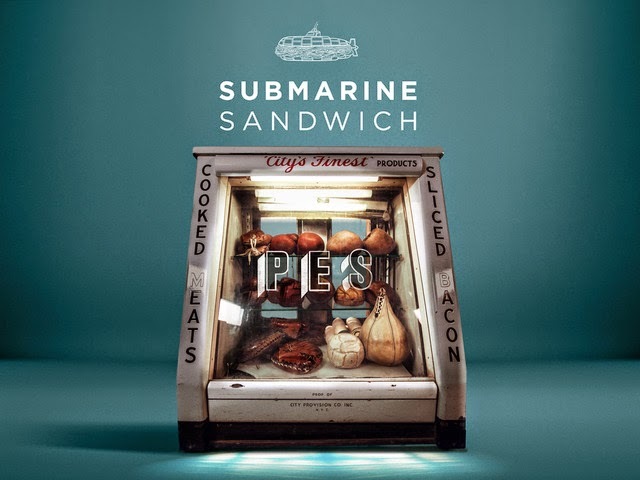 I threaded clear monofilament (fishing line) through the entire sandwich for extra stability. The olive on top is a nice touch, but it also acts as a tie off point for the monofilament. So, I know you're all wondering how the night went, I know I sure did. 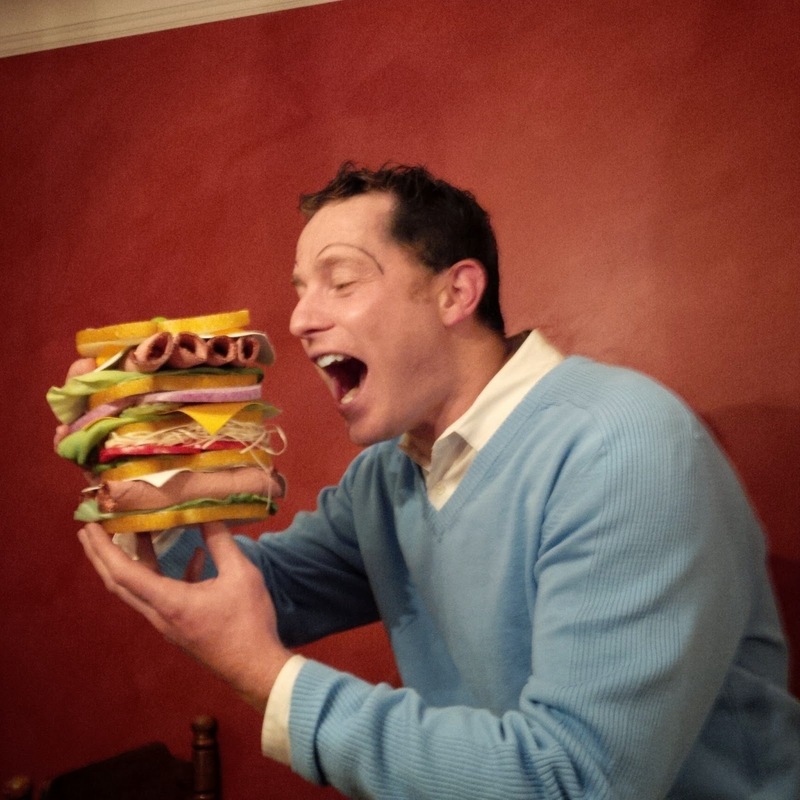 Jamison loved the sandwich, and carried it with him all night. See? My favorite part is how he did Dagwood's eyebrows! Awesome! According to Jamison, he had to protect the sandwich from thieves, and hungry revelers, so I think we can call it a success! Special thanks to Jamison for this one- I had such a fun time making this project, and I'm glad you enjoyed the final product. Hey all! I talk a lot about how context is really important for 'selling' a food prop. Ginger ale in a champagne flute is champagne, in a beer stein it is beer, or in a ginger ale bottle where it is....well, you get it. Instant mashed potatoes can be made to look like ice cream or lemon meringue pie if you put them in the right container- and cotton batting can look like mashed potatoes if served in a bowl next to a turkey. Often times, performers need to consume a food from a container which is no longer produced. Sure, it's easy to wrap a sparkling soda can with a beer label, but beer cans used to be straight sided with a small opening, and now we have cans that taper near the top and bottom, with wide mouth openings. Contemporary labels may look like their vintage counterparts- except for the huge UPC symbol and Surgeon General's warning. There are lots of tricks to make your food packaging look right- but the first step is knowing what you're trying to accomplish- and I have a few links I think might help. Put together by the Bureau of Land Management and the Society for Historical Archaeology (how cool is THAT!?) this website is full of information about glass bottles of all types and ages. Katie Andrew at Milwaukee Rep found this one for me. This site is a fantastic find for propsters. You can search by brand, price, era, company, etc for your candy wrapper needs. There's also a blog about candy wrapper history. Pretty swell! Thanks to Hannah Burnham at USC for sending me this one. Another neat archive of vintage candy wrappers- check it out!